I spent a good deal of September through November preparing my work for installation at the MacKenzie Art Gallery as part of the exhibition Synthetic Age. The show, curated by Jeff Nye, is a collection of works by Fine Arts Faculty at the University of Regina and First Nations University of Canada and it has been installed in two stages. The show opening is Friday, January 18th and that evening will also launch the current season for New Dance Horizons. My piece is the largest wall piece I’ve created and is unusual for me in that I typically do not work al dente – usually my works are completed well in advance of installation, but since this is a site-specific work that will exist only for the duration of the exhibition (until April 2013), I had the opportunity to make the work on site. 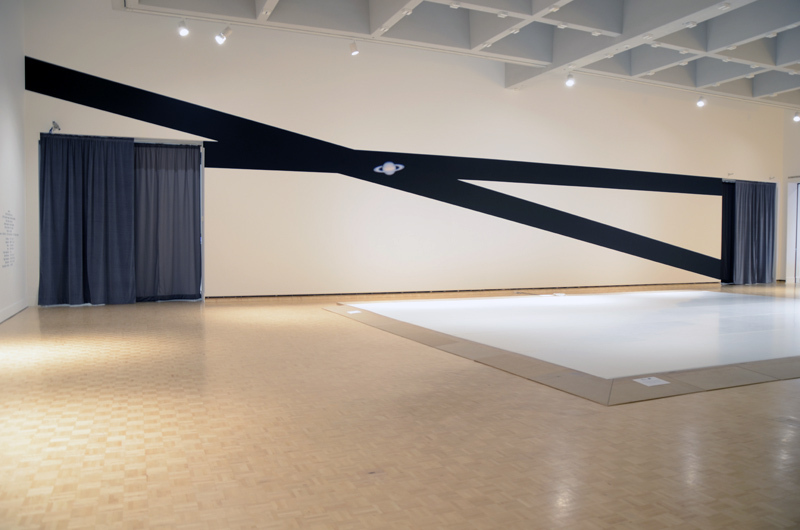 Back in June when Jeff asked me if I’d be interested in further developing the wall vinyl I installed last year at FNUGallery on the 70 foot-long wall of the Kenderdine room at the MacKenzie I was just a bit intimidated! It is a huge wall, and it also serves as the context for New Dance Horizons performances throughout the season (I’ll post more images taken of the work during these performances as they happen). 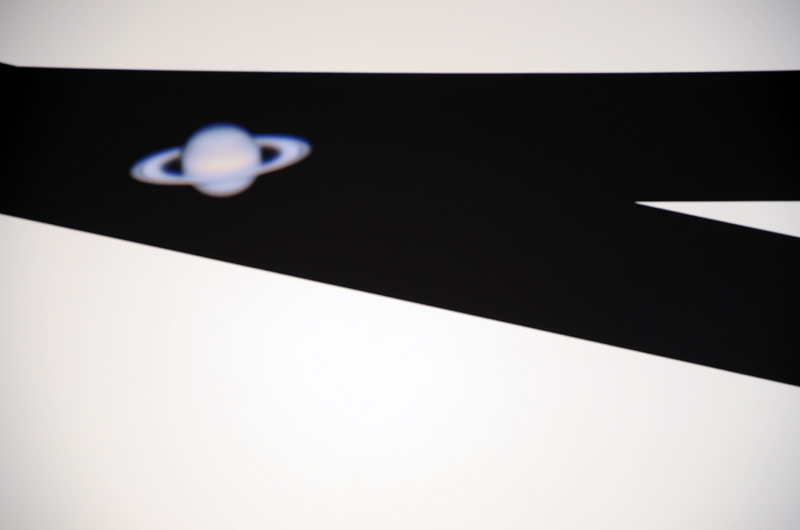 The piece is a vinyl installation spanning 70′ using a stacked image of Saturn (22/720 possible frames) that I photographed on May 11, 2012 at 10:35pm in Richmond Hill at the David Dunlap Observatory (see the ‘From’ coordinates above) using the largest optical telescope in Canada. The telescope has a primary mirror measuring 1.88 meters (74″) and has an effective focal length of 33,000mm. The wall text reproduced above is installed at the gallery and identifies technical and factual data of the moment when the images were collected including Saturn’s position amidst the zodiac and relative to earth and the sun. I used Keith’s Image Stacker, and modified the image using Photoshop only to invert the image horizontally and rotate it, to correct the inversion caused at the mirror by the eyepiece of the scope. I used my Nikon D7000 at prime with a .75 focal reducer – you can read my blog post from that night here. Jeff and Timothy Long, the Head Curator at the MacKenzie were really instrumental in working through both technical and aesthetic aspects of the installation. We met several times to test for the size of the printed image and to discuss my various ideas for the design of the vinyl strips, working through the logistics of mounting 70 and 55 continuous feet of adhesive vinyl. The preparatory team at the MacKenzie is fabulous – Ralph gave much needed direction and Peter, along with Jeremy from Advantage Sign and Graphics, did the physical work. So many ideas arose during my conversations with Jeff and Tim. I had quite spontaneously mocked up a sketch using the long horizontal line, which initially referred to a horizon line – be that in the prairies, or more generally. Tim liked the way the two lines also refer to the the ecliptic and the orbital path of the planet, though these aren’t arranged in my installation using those specific coordinates. Once the work was up I was amazed by the way the wall seemed to disappear within the dark intersection of the two lines; the planet seems to hover in that dark void. It is a very simple yet contemplative piece that reveals the complexity of both its creation and the scale of the solar system. I can’t wait to create my 2013 image! I’d like to make a special thanks to the volunteer crew at the DDO and RASC Toronto Centre who have become great mentors and partners in learning and disseminating knowledge about astronomy, and without whom I would not have had access to the DDO scope. I look forward to my visit next month, and spending some time in summer with you all learning how to use my CGEM! I would also like to acknowledge the Saskatchewan Arts Board, which awarded me an Individual Artist Grant to produce this work, and Imaging Saturn (oppositions 2011-2040), which will be debuted at MKG127 Gallery in Toronto on February 16, 2013. 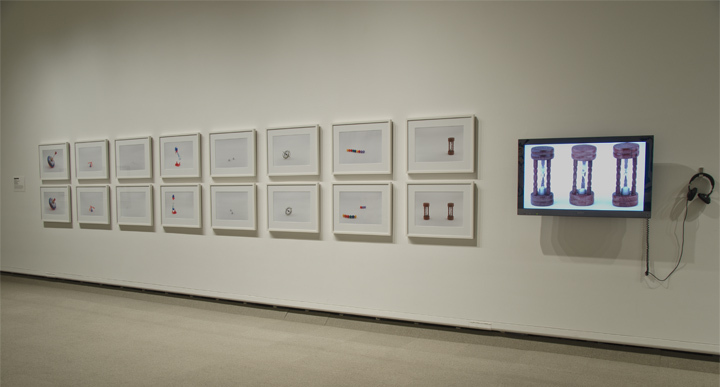 I’m also exhibiting Pacing Time at the MacKenzie Art Gallery, which debuted at MKG127 in 2010. I made these works with the impulse to highlight the interplay between the adventure of creation and the routine activity of simply passing the time. As if being-in-the-moment is too factual a predicament of/for being. These works describe my preoccupation with time, space, and chance. Eight objects that have some playful scientific significance are put in to motion and stilled through this collection of 8 pairs of digital chromogenic prints, and accompanying high-definition video. 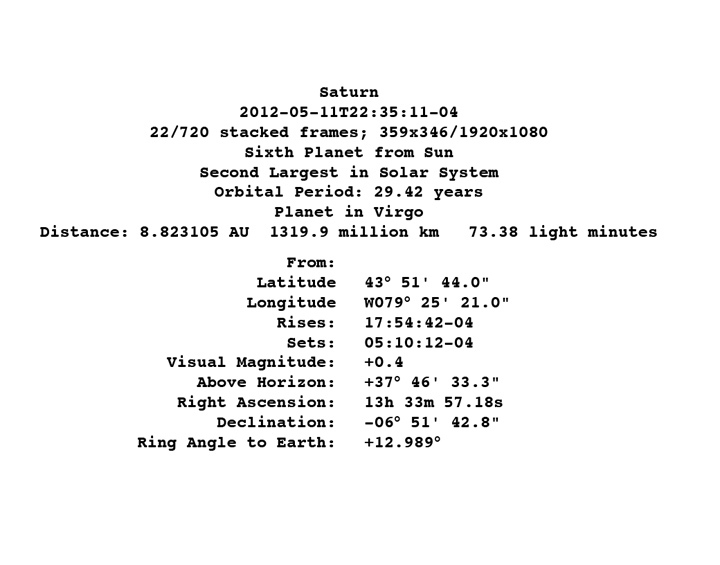 This entry was posted in Exhibitions, Images of Saturn. Bookmark the permalink.